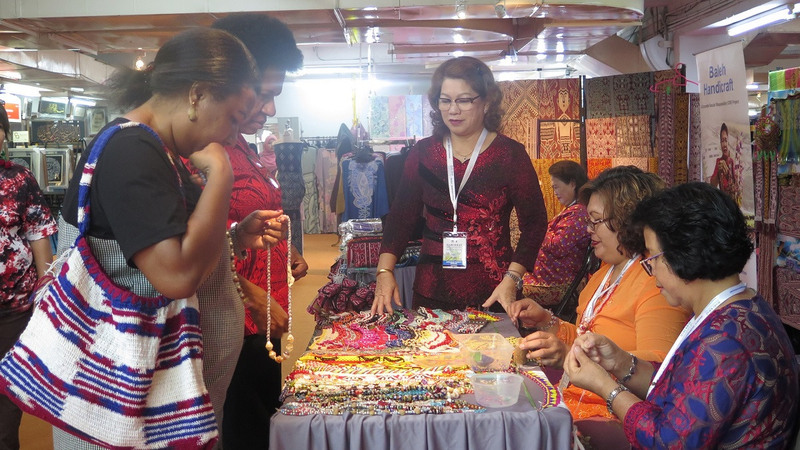 KUCHING, 4 APRIL 2019, THURSDAY: Authentic handmade handicrafts of the artisans from Murum and Baleh under Sarawak Energy’s Corporate Social Responsibility (CSR) Handicraft Development Programme garnered overwhelming response at the recent National Craft Day 2019 in Kuala Lumpur. 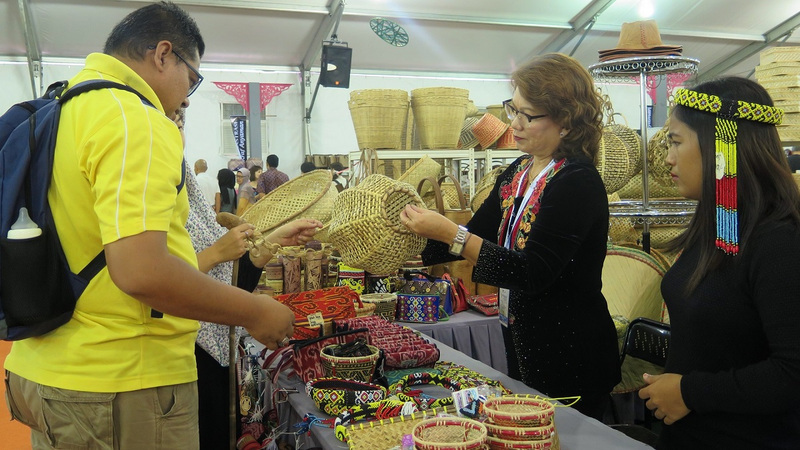 The artisans sold around RM19,000 worth of handicraft products at the 12-day event at the Kuala Lumpur Craft Complex which carried the concept “Culturising Craft in Lifestyle”. The Raja Permaisuri Agong Tunku Hajah Azizah Aminah Maimunah Iskandariah Almarhum Sultan Iskandar was the guest of honour at the launch of the event. 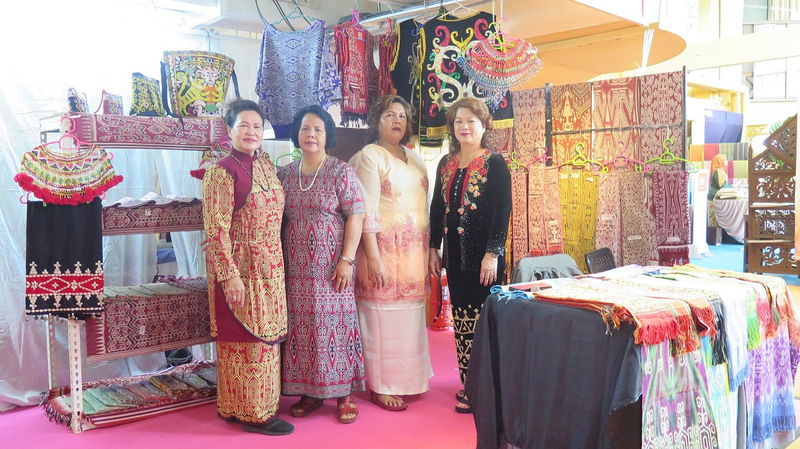 The artisan’s participation in the festival was made possible by Sarawak Energy in partnership with the Malaysian Handicraft Development Corporation (MHDC). Murum was represented by artisans Sheila Bayak, Meron Kulleh and Permai Asan from Long Malim in Tegulang, Murum whereas Baleh representatives were artisans Josephine Midong Anak Jubin from Rumah Nabau, Dapong Anak Sempurai and Lily Anak Siba from Rumah Laso and Liban Anak Jinggau from Rumah Tajai in Ng Antawau, Baleh. YB Datuk Abdul Karim Rahman Hamzah, Sarawak Minister for Tourism, Arts, Culture, Youth and Sports, and YB Datuk John Sikie Tayai, Sarawak Assistant Minister of Native Laws and Customs stopped by Sarawak Energy’s booth to show support to the artisans. They were accompanied by Jiwari Abdullah, Sarawak Energy General Manager for CSR and Sustainability and MHDC Sarawak Director Azran Arip. Their crafts and textile designs were showcased alongside products from both international and local artisans and this provided the artisans a platform for networking. The artisans also benefited from the exposure which can further enhance their craft making skills and develop their marketing techniques. Commenting on the artisan’s participation, Jiwari said, “We are always looking into ways to promote the artisans under our programme. We believe that giving them the right exposure will develop not only their craft skills because they get to exchange knowledge and ideas with other fellow artisans but also enhance their marketing concept and strategies. This is very important if they are to create a sustainable flow of income from the handicraft trade. Murum and Baleh artisans in a group photo with Sarawak Minister of Tourism, Arts, Culture, Youth and Sports YB Datuk Abdul Karim Rahman Hamzah (centre), Assistant Minister of Native Laws and Customs YB Datuk John Sikie Tayai (10th from left), Sarawak Energy General Manager for CSR & Sustainability Jiwari Abdullah (11th from left) and Malaysian Handicraft Development Corporation (MHDC) Sarawak Director Azran Arip (right). Meron from Long Malim in Murum and Dapong from Rh Laso in Baleh showcasing their crafts to the visitors. Baleh artisans (from left) Josephine, Lily, Liban and Dapong with their beautiful authentic crafts and textile designs.